John Lewis Never Knowingly Undersold TV advert, launched in September 2011, showcases the role the retail company’s electrical products have played in the lives of customers over the years. The advert consists of seven scenes, each representing a different era, ending with two teenagers enjoying a performance of “Shine On” by the Kooks on the latest internet enabled Sony Internet TV. The ad finishes with the tag line “Never Knowingly Undersold”, the pricing promise at the heart of the John Lewis brand. 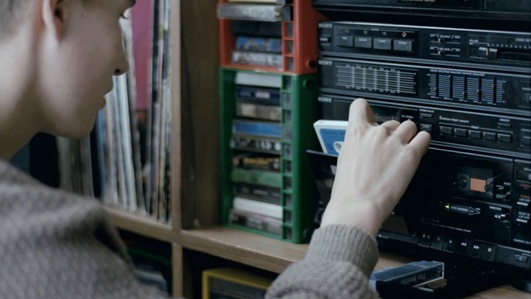 In the opening scene a young boy making a mix tape “For Julie” in his bedroom listens to a cassette of The Smiths on a Sony hi-fi system. We move to The Selector’s ska track “On My Radio” blasting out of an old school boom box, prompting a playful dance-off. In a 1960s coffee bar we hear “I Only Want to be With You” played on a Roberts Radio. In a cosy family room the theme from the television show “The Adventures of Black Beauty” is played on a Thorn colour television set. Elton John’s “Rocket Man” on the record decks of a school common room. Sade’s “Smooth Operator” plays through the headphones of a bright yellow Sony walkman while a women relaxes in her pool. We finish in the present day with Smart TV and The Kooks’ ‘Shine On’ as a first kiss gets interrupted by mum! The Through The Ages campaign was developed at Adam & Eve by creative directors Ben Priest, Ben Tollett, Emer Stamp, creative team Sidney Rodgers and Harry Budgen, producer Leila Bartlam. Filming was shot by director Ringan Ledwidge via Rattling Stick, London, with producer Sally Humphries and director of photography Jess Hall. Editor was Rich Orrick at Work Post. Post production was done at The Mill, London, by VFX Producer Gemma Smith, 2D lead artists Barnsley, Andy Dill, colourist Mick Vincent. Sound was produced at Jungle Studios by James Saunders. Music was mixed by music producer Bullion, and licensed at Leland Music.